It’s well known from extensive research that fragrance, whether natural or synthetic, is a common sensitising ingredient for all skin types. Yet despite this information, fragrance components lie in wait in more skincare products than you can imagine. Lots of people have a difficult time accepting the fact about fragrance being a problem for skin, so the best place for us to start is explaining what the concern is all about. The way most fragrance ingredients impart scent is through a volatile reaction. Unfortunately, this natural reaction almost always causes a sensitising reaction on skin. In fact, research has established that fragrances in skincare products are among the most common cause of sensitising and other negative skin reactions. And this is true for all skin types, not just those with sensitive or redness-prone skin. You might very well be thinking that because your skin doesn't show signs of being bothered or aggravated by the fragranced products you’re using, then it must not be a problem that applies to you. We wish that were true but it’s still a serious concern because skin is very good at hiding when it’s being aggravated. You might not see the damage on skin’s surface, but it can be silently occurring every day, causing minor problems for your skin in the short term and worse problems in the long term. Think about it like sun damage from not wearing a sunscreen. Research shows that sun damage begins within the first minute your unprotected skin sees the sun. This damage is cumulative and potentially deadly, yet separate from a sunburn or tan, you never feel or see anything taking place on the surface of your skin. All the damage is still taking place, but won’t show up on the surface of skin until years later. Why Do So Many Products Contain Fragrance? That’s a great question, and the answer is really simple: It’s because most people like when their skincare and haircare products smell nice. Cosmetic companies understand the power of a pleasingly fragranced product, and how that impacts a consumer’s buying decisions and their experience of using the product at home. Another reason fragrances make their way into the products you use is that lots of cosmetic products naturally don't smell very good without the help of fragrance. A beautiful, wafting scent helps cover up the product’s less-than-pleasing normal smell. But there are ingredients and formulary steps to take that result in a neutral-smelling or non-objectionable fragrance-free product. In other words, adding fragrance products isn’t a necessity. Added fragrance also helps hide the unpleasant aroma of a jar-packaged skincare product you’ve kept too long, especially if the ingredients are all natural. Jar packaging causes ingredients to degrade faster because once you open it, the delicate ingredients are exposed to air and bacteria from your finger repeatedly dipping in. Think about how long a head of lettuce lasts in your refrigerator and how it looks when it turns: Not a pleasant thought! Essential oils or natural fragrant ingredients are no exception to this rule. While many essential oils and fragrant plant extracts do have beneficial properties for skin, their volatility as they release their aroma is not good for skin. What makes your nose happy doesn’t make your skin happy! There are lots of plant oils and extracts that have remarkable benefit for skin and none of the downside fragrant plant oils and extracts have. Those are the types of natural ingredients we use in Paula’s Choice Skincare products and love to see other brands using, too! Unfortunately, it can't. 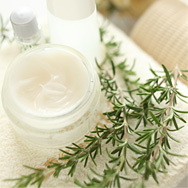 Some natural ingredients have a pleasant fragrance but cause no irritation and are great for skin. Examples include melon, vanilla, cucumber, aloe vera, almond, mango, coconut, cocoa butter, shea butter, and cucumber. Other times, the product may have no aroma because the fragrance is included to mask the odor of the real skincare ingredients which don’t smell agreeable. Ironically, the fragrance is added so the product has no discernable scent! Many beneficial skincare ingredients (antioxidants, for example) have a natural fragrance, and some of them even smell great! Distinguishing potent antioxidants that defend skin from the environment from those that are simply added to make you "shop with your nose" isn’t easy. Like anything in skincare, the basic information is (or at least should be) on the ingredient label, but because most ingredients read like a college chemistry course, they’re impossible for most people to decipher. We want to assure you that here at Paula’s Choice Skincare, we never add volatile or masking skin-aggravating fragrances of any kind to our products and never have. There are too many amazing ingredients that impart brilliant results for skin that are completely non-irritating to ever bother with the problematic ones. It’s part of our mission to rely on what scientific research has shown to be true so you can take the best possible care of your skin—and that means avoiding or at the very least minimising your skin’s exposure to fragrance.